This dramatic video tells the story of St. Gerard Majella, a Redemptorist Brother from Souther Italy, whose purity, faith, love of God and obidence to our Lord and his Superiors are models for us today. Shot on location in Itlay, Ireland and the United States, this video brings to life the extraordinary passion and devotion of ST. Gerard... from his erliest days to his all too brief life as a religious, when he performed so many miracles that he became known as the "Wonder Worker". Get to know St. Gerard and why he may soon be the patron saint for the unborn. 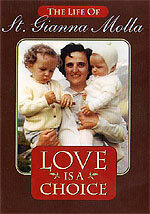 In this DVD Dr. Clowes relates amazing stories of pro-life leaders and what they have accomplished. You will hear of the successful abstience program in the Phillippines, How HLI has trained over 10,000 priest and seminarians around the world in the last five years. You will learn how the anti-life revolution has gained control of our society and what must be done to counter this revolution and much more. The modern technoligy of the real time ultrasound now reveals the actual responses of a 12 week old fetus to being aborted. As the unborn child attempts fo escape the abortionist's suction curette, her motions can be seen to become desperately agiated and her heart rate doubles. This is a film that reveals the truth of abortion that most people will never know about or want to know of.